It's been a bit since we've had any updates here. We've got more than a few irons in the fire, though, so let's just dive into a quick update. We love the Fate Core game system and offering a version of Accursed for that setting has been on our to do list for a couple of years. 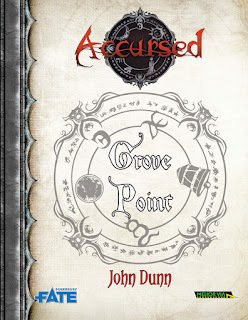 John finally found some time to get a real start on it, and he's produced a hack of the Grove Point 1-sheet as a publicly available taste. It's now up on DriveThruRPG as a Pay What You Want product. If you're even curious about how this might look, please grab a copy and give it a read. We've even included pregenerated characters to go with it. Please don't worry about any kind of payment until you've given it fair consideration. Then, if you'd like to see us do more with this please consider leaving a review and/or making a $1 payment. We're using this as a bellwether to determine if there's an audience for more. 2016 has been a pretty challenging year for a lot of people. Fortunately, Melior Via has generally done okay this year, but we wouldn't have without your support. 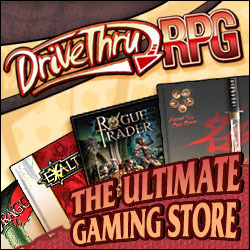 As a small way of saying thank you, we're discounting all of our digital products on DriveThruRPG starting at 9AM CST on Thanksgiving and running through Monday. Happy Thanksgiving.